If you are Male Primary teacher and waiting for your transfer from your home districts or another district then we would like to inform you if everything will be ok then you will be able apply for your transfer at your home districts shortly. Currently this facility is only available for female primary teacher of uttar pradesh. Application form inter city male transfer will be invited only online. Top official asked proposal regarding this matter. Most probably transfer list will be publish in the month of June 2015. this is really a parsing news that now male teachers can also get their desired district for teaching just like female teachers. 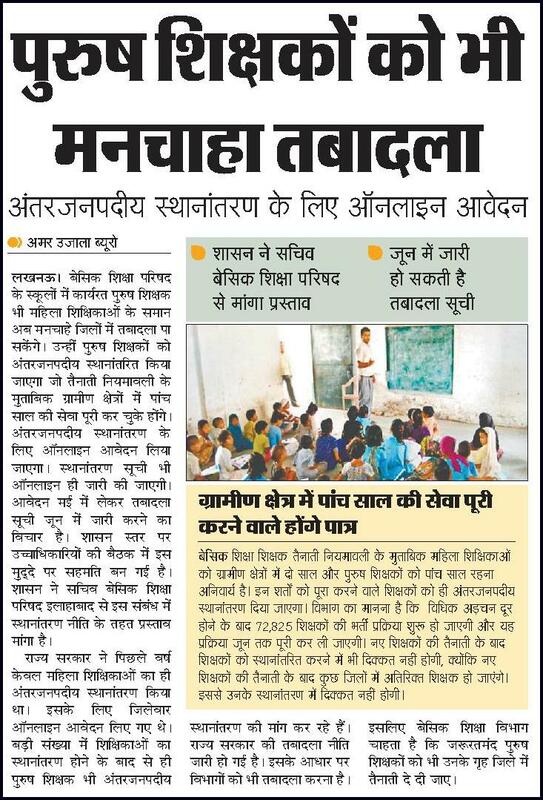 only those primary teacher will be eligible who completed there 5 year teaching in rural areas. Transfer list will be also publish online. Online application form will be invited in the month of may after that merit list will be publish in the month of June. Top officer of up basic education department also agree on this matter. That’s they asked to make a proposal for approving this cabinet. State government of uttar pradesh previous year only provide transfer facility from one district to another district form female primary teacher. Since last year male primary teacher was also demanding regarding their transfers. So basic siksha parishad now given the benefit of transfer to male teacher to there home district. Well what ever decision will be taken by government and department jobslip.in will try to cover all latest news about Up Primary Teacher Transfer 2013. You can ask your questions if you have any other doubt. We will try to give you reply. Procedure of application form for Transfer is very simple. They publish a advertisement / notification in the news paper and a online website like / address will be given in this notification. After that candidates have to fill online application form. After that candidates will call for counselling at district DIET of concerning districts. After that candidates will allotted joining Letter in new primary school of new district. ekta nahi hai na teachers mein.. It looks dt government playing tricks with teacher. ple.sir and maim; kya is bar lucknow transfer hoge pichali bar nahi ho paya tha, kya is bar bachi femails teachers ka tran.ho jayega. trans.form kab tak ayege.ple.reply sir. Sir this is very unfair, at least some official declaration of online transfer sholuld be made. people have no value in Uttar Pradesh. jin purush adhyapkon ka gramin shetra me 5 saal me kuchh mahine shesh ho kya wo bhi Antar Janpadi transfer krane ke patr mane jayen ge?